Nice hostel quite in the center. Great 10-bed-room in an awesome atmosphere - clearly recommend it! günstigstes Hostel für alle, die einfach nur einen Schlafplatz und eine Dusche brauchen! Wir haben im 20er Dorm geschlafen, was absolut in Ordnung war! Es war bisschen laut und die Luft war super stickig aber das waren keine großen Einschränkungen. Die Lage ist sehr zentral und wir waren von der Sauberkeit sehr positiv überrascht! Abgesehen davon gehören sarkastische mit Touch zum Unfreundlichen Mitarbeiter zu einem gelungen Hostel Erleben dazu! Empfehlung für paar Nächte! Die Küche dort besteht aus einem Wasserkocher und einer Mikrowelle. I would stay again. The hostel is in the centre and good to stay in if you need a bed to sleep in and a shower. The showers are good but few. Your luggage is also safe there. There is no kitchen or other room to get together. The dorm gets a little crowded and a bit smelly. In the morning at 9.30 they open the door and turn on music. Check out at 10 is taken seriously. All in all for the price it's more than ok.
We had a nice stay, it's really close to the center. The atmosphere however was quite minimal, there's no place to sit and eat or hang out except for the room (where there's literally just beds and small lockers). Not very cozy, but can't complain considering the price. I wouldn't go there again, but it's ideal for people that don't wanna pay alot and don't want to be at the hostel for more than just sleeping. The Location was allright. 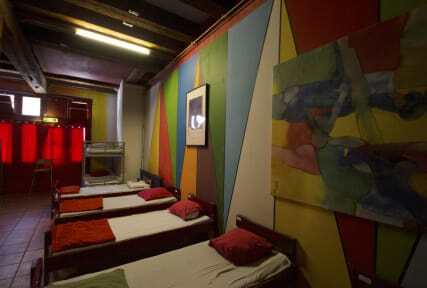 But the rest of the hostel is horrible. The staff (aspecially the bold one) is not helpful at all and most of the time rude. 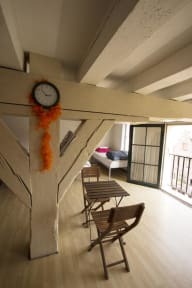 There isn't any atmosphere in the hostel as there isn't a common area or even a friendly atmosphere. And the hostel is CLOSED from 4-6am, you can't even enter it!! PLEASE DO NOT GO THERE IT WAS THE WORST HOSTEL I'VE EVER BEEN TO !! !